"A soft, buttery cookie with a taste reminiscent of a certain famous Derby Day pie. Lots of pecans and chocolate chips!" Preheat the oven to 350 degrees F (175 degrees C). In a medium bowl, stir together the flour, baking soda and salt with a fork. Set aside. Cream together the butter, white sugar, and brown sugar until smooth. Beat in the eggs one at a time, then stir in the bourbon. Stir in the flour mixture just until blended. Fold in pecans and chocolate chips. Drop by large spoonfuls onto ungreased baking sheets. Bake in the preheated oven until the edges are lightly browned, about 10 minutes. Cool on the cookie sheet for a minute, then remove to wire racks to cool completely. Love this recipe! Simply a must try, pretty close to becoming my new favorite Chocolate Chip cookie recipe. Spot on with ingredients and directions. Can't beat it! Solid choco chip cookies, but I couldn't really taste the bourbon. It's so delicious. I made it for my school bake sale. I found some extra large chocolate chips at safeway! Plus, at the fair, I won second place! My complements to the chef. 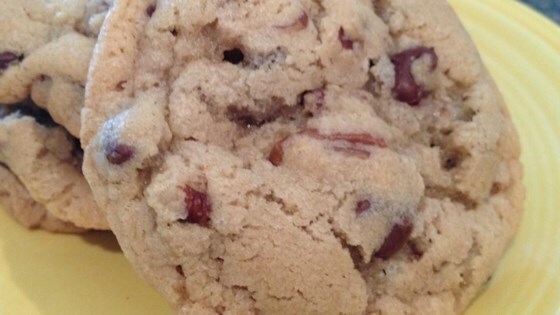 I used white chocolate chips and the flavor is amazing one of the best cookies ever!!! This is the greatest cookie. I am a Snowbird and bake for 2 RV parks. They request these the most often. Thank you Amy!! This is the only chocolate chip cookie recipe I will use. This can be modified however u like and they still turn out great. I will not use any other Chocolate Cookie Recipe. Took to a couples poker game on Derby Weekend. Everyone LOVED them & they were gone so fast, I didn't even get one myself! Easy to make, moist and a nice change from normal chocolate chip.